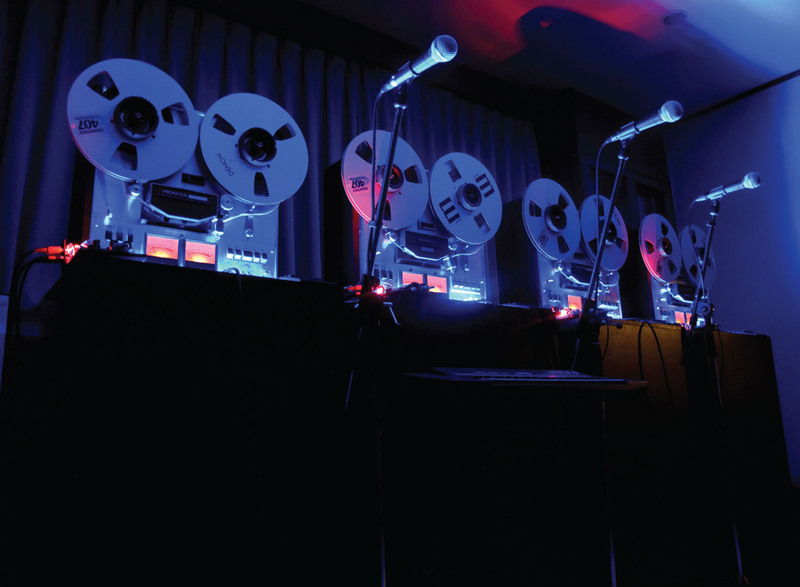 Open Reel Ensemble is performance art by remodeled reel-to-reel tape recorders. Ivan Illich once said: “Convivial tools are those which give each person who uses them the greatest opportunity to enrich the environment with the fruits of his or her vision.” Convivial is originally a French word that means “live together with joy”, and by “convivial tool”, Illich indicates “an instrument (technology) used differently from the usage of industrial value”. This idea inspired transformation of a reel-to-reel analog tape recorder, a device that some consider obsolete, into a musical instrument, as a “convivial tool” using today’s information technology. Reel-to-reel tape decks have disappeared from mainstream use, but by asking, “what if it never disappeared?” the artists recreated it. They attached USB ports to the recorders and customized them so they can “play” them as a musical instrument. The system uses an iPhone as a remote control to synchronize several decks through an OSC transmis-sion network, auto-switching, and real-time sound processing while recording vibrating tapes to forge a sound using solenoids to control the recording operation and looping the output. Welcome to the world of sound where “what if” echoes!